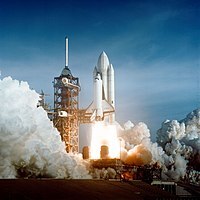 Media in Category:Space Shuttle Columbia, the first space shuttle in NASA's orbital fleet, first flying mission STS-1 from 12 April to 14 April 1981. On 1 February 2003, Columbia disintegrated during re-entry on its 28th mission, STS-107; all seven crew members aboard were killed. English: This category is part of the category scheme space exploration. Français: Cette catégorie fait partie du schéma des catégories concernant l'exploration de l'espace. This category has the following 30 subcategories, out of 30 total. Media in category "Space Shuttle Columbia"
The following 29 files are in this category, out of 29 total. This page was last edited on 5 January 2019, at 19:36.